Do you love Phineas and Ferb? THE BEST LIVE TOUR EVER! “Mom! 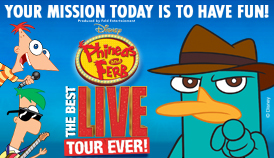 Phineas and Ferb are going on a live tour!” Join the Danville Tri-State Area Gang for a high-energy ride through their wildest invention yet in Disney’s Phineas and Ferb: The Best LIVE Tour Ever! The beloved characters from Disney Channel’s animated series embark on a bold escape from the television screen to a live action adventure – right here in Indianapolis! Phineas and Ferb are gonna do it all! Good for the 4pm & 7pm performances only and not valid on previously purchased tickets. Offer ends Nov 3, 2012. I have four tickets to give away to one of my readers! you must be 18 or older to enter to win. “How do I enter?” you may ask. You must present a valid ID at the box office and I will announce the winner here on my blog Friday October, 26th. The Walt Disney Company is neither a sponsor nor endorser of this sweepstakes. Would love to take my nephew to this!